Home Articles Settings User Timing Or Real Player % in NBA2K? 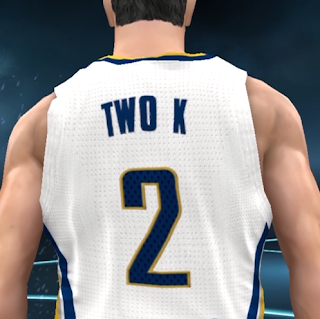 User Timing Or Real Player % in NBA2K? In the game settings menu, there's an option for "Shooting Type". You can choose from one of two options. 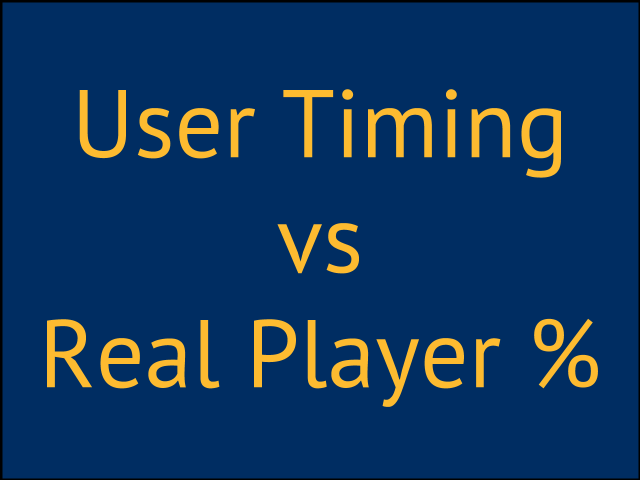 The first is "User Timing" and the other choice is "Real Player %". I've noticed there's some confusion on how I think these two settings work and which one is better for you to use. The default option is user timing. Each player in the league has his own shooting release. Paul George will have a different release than CJ Watson who will have a different release than David West. Because of this, you'll have to know each player's release (and how much space they need) in order to be effective with them. Some releases are easier to learn than others. Each release can either be very early, early, excellent, late or very late. You goal is to get an excellent release on every shot you take. But even if you do get an excellent release, it doesn't mean that it's guaranteed to go in. It also doesn't mean that a shot release that wasn't excellent won't go in either. Those can go in even if not perfectly timed. How likely that is will depend on the difficulty level and sliders you are using and whether it was a good shot, who was guarding you, whether your player has the ability to hit shots from there, the game situation and the defensive scheme employed at the time. The other option is real player percentage. What this does is remove shooting releases from the equation. Because of that you can shoot the same with each player. You just shoot, release and not worry about timing. Each player's unique release point is no longer a factor, it's up to the percentages. The other things are still important and still effect the shot. The difficulty, sliders used, the defense, shot selection and who is guarding you all come into play. Which Shooting Type Should I Use? The first problem I see with these two choices is how they are named. Because they named one shooting type by putting the word "real" in it, it gives the impression that it will provide more realistic shooting percentages and therefore must be better and even more challenging. Guys that stake their claim to sim basketball often feel it's more sim to use real player percentage because of that. One of the other reasons that guys gravitate to that option is because they have played guys in quick match and have been torched. They've assumed that this is because his opponent knows the releases and all there is to it is getting an excellent release and the shots go in. While it's true to some degree, it's not the only factor. The biggest factor is taking good shots. No matter what option you choose, good shots go in. What a good shot is - is debatable. Players often equate open shots as good shots and they aren't always good shots even though they can be. But of the two options, user timing requires more skill and knowledge of your team. 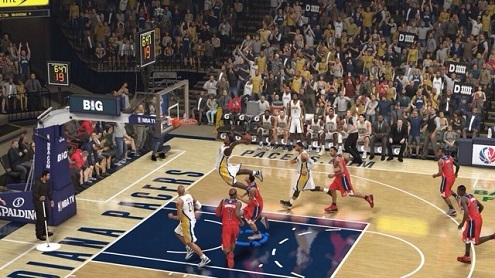 With user timing you have to not only take a good shot for that player, you also have to shoot right with him. So to me the difference between the two options is that one requires knowing shot releases and one does not. Of the two options, I feel user timing is harder not easier and that's why I recommend it. Also, if you play users online, the only option is user timing. It makes sense to make your skills portable from mode to mode. To me, I think using user timing also makes the game more sim because I have to shoot different with each player instead of just hitting a button and not worrying about it. It also makes the game more interesting if I know I've got 12 unique players to learn how to shoot with. I've shot a high percentage (over 70% on 12 minute quarters, hall of fame difficulty and simulation sliders) in games using user timing and also in games where I have used real player percentage. To me the over riding factor is taking good shots. If you do that, you will do well. What's a good shot? Well that's going to depend. Only time spent playing with your team in tons of situations will tell you what a good shot is for each player on your team. You have to recognize each players unique abilities and apply that to the game at hand based on the defense being played, who is on the floor and the game situation. How do you feel about these two choices and which do you use? Let me know in the comments. I am about to try real fg % I play as mavs and rondo in my gm is right now an elite shooter lol. He is shooting about 55 percent. As much as I like it it's not challenging or realistic. I also use operation sports SIM sliders. It calls for real fg % but I've never used it so instead of playing on pro I went up one. The problem with going up further is it makes the other team UNSTOPPABLE! So as you can tell I'm finding it hard to reach the most realistic experience I can get from it. So as I stated I'm about to try real fg % and see what I get. I never saw much difference between the two. What matters most is good shot selection. If you take high quality shots, you'll shoot a high percentage. It's just really hard to find a balance whether it's sliders or whatever idk how to make it a truly realistic experience. I just started a gm mode with the Thunder and blew out ever team the Clippers I beat by over 30.... idk how to do this. Lol its so frustrating. % which is more like it.. .. When you play online vs friends, you can only use shot timing. Unless you are in an online myleague setup, you don't have the option to use real player %. Thanks for the question! Whats frustrating is, sometimes i miss wide open threes because my timing is bad. And i rarely gets wide open shots. Online it's all user timing. If you play online a lot, to be consistent I'd use user timing for both offline and online games. thx ! i would have some questions for the online mode in NBA2K16 (ps4), what is the best team for the online mode to play with? iam playing with OKC atm. timeout and substitute auto or manual? iam thankful of any other tipps&tricks like for the Defense / offense etc. btw iam on the 4th league in online (euroleague) and its not easy to win. anyways thanks in advance, Peace ! ok thx. any other tipps&trick you can give me for the online mode? offense/defense, timeout auto/manual, substitution auto/manual, any strategy to score easier etc ? When it comes to what team to use, I'm a big believer that if you live near an NBA team that you should use that one. For example. I am from Indy and have been a Pacer fan my whole life. So when the game comes out, I've just made the decision easy - I am going to be the Pacers year in and year out. Now, if you aren't like me, then the best advice I could give you is to pick one team and use it exclusively. I also run on all manual settings. Mostly, I'd recommend getting to know your team well. How to use every player on the roster, all their plays, how to use the controls, etc. Then it's just getting on the court and putting in the time to work. While I consider myself a hall of fame level player, I'm not ashamed to say that I also work on rookie level a lot each year to get to know my squad. Don't be afraid to bump down the level to learn. I don't know about user timing being more difficult. I play in my gm mode and user timing is way easier. With user timing, I just catch and shoot . That simple. I have had Joakim Noah and Deandre Jordan making 30 footers with user timing. I just catch and shoot. With real player%, I have had Rose, Butler, etc... missing easy wide open shots. My user timing % is 65-70% while real player is 50-55%. There is nothing to user timing. As soon as you catch it, shoot it. It goes in no matter where you are or who is shooting. It'll depend on the user. If you are good at timing, then you'll do better with user timing. If not, you'll do better with real player percentage. A lot of boils down to shot selection too as well as how the game has been tuned by the developers at any given time.